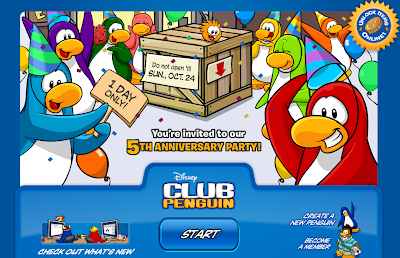 Club Penguin Cheats by Mimo777 Club Penguin Cheats by Mimo777: Club Penguin Anniversary Party Start Screen! Awesome! I can hardly wait for the party, you? I love the anniversary party! Although it always takes a while to get into the coffee shop. I love the cake there! Yum! I also like the mystery of what the colors for the party will be! Just been on Club Penguin and noticed that when you click on someone and their player card comes up, the background and their clothes fade in and not just appear. Quite a cool update and thought I should share! have you noticed when you click your self now there a effect! There is a glitch on club penguin, of when you click on your or someone elses playercard that it loads slow, and when you look at the top left of the screen sometimes you seen people's names moving. I like the cake too! Every year it's yummy! It certainly does look awesome! Maybe the box will burst out with balloons as well as party hats! Thanks for letting us know! It's quite cool! I cant wait! I really want an anniversary hat(last year, I forgot that there was a party! lol). Yeah, me too. Don't you wish it was like a five-day party or something? Weird. Keep commenting! Look at the top of the new start screen. The salmon penguin's hat is cut in half but if you notice it is a new hat (with new colours). This will be this years party hat. it's like i said before i'm collecting party hats. I got 2 so far soon 3. I love the anniversary party!It seems weird to me whenever i'm online in the party on Club Penguin. I always felt happier than ordinary days.I was so happy to have an EXTRA party with my buddies in my igloo! We had delicous cakes, and cold drinks! Oh, Mimo777! If only you were in the party with my buddies! I love October in Club Penguin as you get the Anniversary Party and the Halloween Party. I think the colours of the hat will be yellow, blue and green. I remember someone said about colours of balloons and the hat are normally the same, and this year on the advertisment, the balloons are yellow, blue and green. Please put me up if I'm right! I like your theory! Good noticing about the balloons! You forgot there was a party!? I hope you get a party hat this year!